Seahawks wanted to work out Kaepernick in April, then didn’t. What happened? We’ll never know, because NFL did what it does well: Avoid accountability. The settlement between the NFL and its player-antagonists Colin Kaepernick and Eric Reid was remarkable on several counts, not the least of which was the underappreciated fact that it was tie. As we all know, Americans don’t do anti-climaxes well; our lives are pathetically full of them, so please don’t inject them into sports or the conclusion of The Sopranos. Besides, the mutual agreement to not disclose terms and conditions of the settlement is going to drive bats the football world, lingering on past all of our days, haunting us like the shadowy figures on the grassy knoll in Dallas. A draw invites all of us to pick winners and losers (as well as both or none) while being safe in the knowledge that we won’t be proven wrong, yet nevertheless likely to sound stupid to the guy on next stool. For sure, it forever makes opaque the Kaepernick football narrative. Think about this: The precious career time he lost may well have put him, at 31, beyond the point of top-flight return, yet he’s unlikely to be able to prove otherwise because no club wants to be the village idiot that, by having him succeed, proves Kaepernick’s point: The whole tribe is full of village idiots for denying him a job based on social politics. The Seahawks may be the one team that has the teensiest standing to do so, because at least they had planned to give him a workout in April 2017. 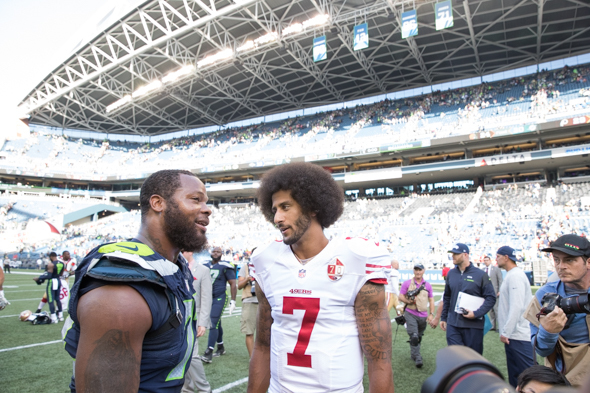 Then came the story that the workout was nixed after Kaepernick, according to unnamed sources, declined to answer the Seahawks’ question of whether he would continue to protest during the anthem. We stand for love and justice and civility. We stand for our players and their constitutional rights, just as we stand for equality for all people. We stand against divisiveness and hate and dehumanization. We are in the midst of a tremendously challenging time, a time longing for healing. Change needs to happen; we will stand for change. May we all have the courage to take a stand for our beliefs while not diminishing the rights of others, as this is the beating heart of our democracy. As a team, we are united in a mission to bring people together to help create positive change. We can no longer remain silent. If it the two episodes seemed to you like the Seahawks wanted it both ways, you would be right. All teams did, desperate to appease their majority-black labor force and not offend the many white conservatives in the stands and in the TV audience. In October, Kaepernick filed the collusion grievance against the NFL, alleging he had been denied employment as a result of his stance. Among the many deposed in the case were Carroll, general manager John Schneider and owner Paul Allen. We’ll never know whether the Seahawks’ curiosity about Kaepernick waned on its own or because of pressure brought from within the NFL. But if I were Kaepernick’s lawyer, I know where I would have started with questions. Easy as it is to mock the NFL’s clumsiness in these situations, I would be surprised if there were paper, digital, audio or video trails about blacklisting Kaepernick. As with any company, the senior people know all the codes, tropes and traps. No need to write or speak of sacred cows or toxic stews. Yet the powers nevertheless sensed risk; the league previously had lost its attempt at a summary judgment, indicating the arbitrator felt some evidence was there to continue the grievance hearing. If, for example, the Seahawks were willing to have tested Kaepernick’s football skills, then, at the behest of a league employee, abruptly set a non-football pre-condition before the test, the episode would have established collusion by the terms of the collective bargaining agreement, and be seen as an act of racism by players and their supporters. Whatever the evidence, it seems highly likely that the league chose the far lesser evil of reimbursing Kaepernick for past and future income losses, and paying more dearly for his silence. That way, the league admits no wrong-doing, just as it did with the concussion settlement. It threw almost $1 billion at the retired players without having to admit responsibility for hiding the known effects of traumatic brain injury from football collisions. A billion dollars seems like a lot. But divided by 32 teams and paid out over years for an industry that generates about $15 billion in annual revenues, no, it isn’t. So settling with Kaepernick is, for the NFL, little more than a rounding error. The legal conclusion to this saga does not bring an end to the NFL’s uncomfortable place in the country’s fractured political life. I have a theoretical for the owners. What if a middle-of-the-road NFL quarterback like, say, Joe Flacco (career QB rating 84, Kaepernick 89), decided that he would kneel for the national anthem as a protest against those attempting to stop a border wall with Mexico? What if Flacco sincerely believed that the threat to the welfare and security of the U.S. was so urgent that he would risk his career to exploit the pulpit inevitably granted to the pre-eminent position in America’s most popular game? I realize the analogy is imperfect: Racism is a 400-year tradition in the U.S., whereas the wall is a fever dream of a desperate president. Nevertheless, Flacco would appear to be advocating a controversial position (“Not my America!”) held by a minority of fans (according to all contemporary polls), one that the majority would find contemptible. Would the NFL feel threatened enough by Flacco’s politics to conspire to keep him out of the NFL? Or would they simply agree with him, since he looked and sounded like most of them? Maybe they just invented a fresh option: Buy him out with more money than if he kept playing. Does the restaurant owner retain the celebrity chef when it becomes know she spits into the food of 30 percent of the patrons? Good bye Michael Bennett. Hopefully Doug Baldwin will be next. This has nothing to do with social justice and all to do with The Queen of Thieves getting kicked to the curb like she did by Pres. Obama in 2008. Yes, all of the pay to play people didn’t get a satisfying return on their contributions. Is it worth a civil war because one football player stood in line to get a bad girlfriend? Go for it. What are you writing about with your post? Is this some kind of code talker rant? Did you know you are the only Coug who voted for Hillary? I’m a Husky so you might not be able to grasp the subtlety. I do like that Cougar Gold. You guys make good cheese. As a UW alum, I’d like to apologize to the rest of this forum. We’d like to disown this guy. So you speak for all UW alum? Good to know. Reeb, you’re out there even farther than usual. You are, however, making a better argument for the consequences of too much herb. Have you considered printing this and showing it to your bookie or other medical professional? Good stuff Art, but you left out the other possible reason the Seahawks didn’t go very far with Kaepernick. He was not willing to take backup money and may have wanted to compete for the starting job. The Seahawks had neither the money nor the inclination to piss off Russell Wilson. That’s not to deny that the NFL wanted nothing to do with him. It’s interesting that this settlement happened after a season in which there were still muted protests by players, but no visible activity to agitate the fan base. The league surmised that it was safe to pay Kaep and Reid to shut up without riling their core. That was the plausible, stated reason for going no further with Kaep. But Kaep never said that publicly. Carroll was the only one offering Kaep’s thoughts. The Seahawks often work out players without signing them just so they have a fresh scouting report for emergency hires. For when, you know, another team might offer a dynamite trade for Wilson. What do you make of the criticism of Kaep for taking the money and shutting up? I think of myself as a principled person, but $50-60 MM would buy a whole lot of my quiet. Kaep sued charging collusion to deny him employment. That was a purely legal/business matter that was part of the CBA rules. Apparently he was correct. I wouldn’t think anything in the agreement inhibits his continued social activism, including kneeling during the anthem. The league and union still haven’t worked out a solution, so I doubt the NFL would unilaterally restrict one player’s behavior. You may have gotten to the heart of the subject. The deep state does pay the NFL owners to have the players come out onto the field and salute the flag. Interesting. Deep state or commercial oligarchs? They may be one in the same. My memory is taxpayer dollars are used to pay NFL owners to have the players take the field and salute the flag during the anthem. I could be wrong about this..hope I am. A few years ago the military was paying the NFL large coin to sponsor/advertise. They were since shamed out of that use of taxpayer dollars for overwrought displays of patriotism. Some team— NFL, AAF or XFL— will give him a shot. That will be a good thing. My guess is it’s the NFL or nothing for him. He believes he doesn’t have prove himself in a developmental league. Not sure I agree. The clock is ticking. He may choose to go where he will play. FWIW, his agent says NFL. In his 25-month absence, he could have played in Canada and declined. There’s a good chance that this rounding error was a boatload of money. My guess is that the NFL was more concerned about owners being exposed in arbitration or open court than actually losing the case. There’s a solid chance that a few insensitive things were on the record, because out of 30 old white billionaires (although I’m sure Shahid Khan and Kim Pegula are capable of being insensitive), many of whom weren’t the ones savvy enough to make the billions, someone probably uttered something Donald Sterlingesque. True about the exposure threat. They may not have have colluded, but just sounded stupid. As far as a boatload, the amount was a lot for two individuals, trivial for the NFL’s finances. I believe if Joe Flacco decided th kneel in protest of the The Wall (cue in Pink Floyd) the NFL would have a meeting with him after the predictable twitter-storm by POTUS. If Flacco continued he’d be allowed to finish the season but be released at the end and the following season he’d have multiplie tryouts but never make a team. Not unlike what happened to Tim Tebow who knelt for different reasons but despite an outstanding college resume could not even beat out a 3rd string QB after leading the Broncos to the 2nd round of the playoffs. To me his short NFL career is a head-shaker. Some question if accepting the NFL’s buyout cheapens Kap’s stance regarding his kneeling for the National Anthem but I don’t believe so. His position for his lawsuit was employment and by being given a settlement the League quietly confirmed collusion which itself is a victory. They have quite the black eye with failures on handling domestic violence, concussions and now this. As usual they cover it all up with money. I’ve always been curious about Kap’s tryout with the Hawks. Did he make the team? Was Pete Carroll overruled? Though asking him if he would continue to kneel is an odd question for them since they’ve allowed players to have a voice in the Anthem protests I assumed they were addressing any possible public backlash which would happen. Now I’m not too sure about the machinations behind that question. Kaep never worked out. As I wrote, it was apparently nixed when he didn’t answer the question of whether he would continue to kneel. Don’t know if that was a Seahawks question or one that came stealthily from the NFL. And my theoretical question was about whether Flacco would kneel over the protesters fighting the wall, making the point that THEY were a disgrace to the flag. Nice “theoretical,” Art. Owners would be thinking “We don’t like the ‘unpatriotic’ kneeling, but we like protesting for the wall (to keep out the people harvesting all our food).” It’s perversely brilliant. I’m sure you’re right: the owners would gladly pay to make it go away. But what would President Bone Spurs do? I think the tension between his faux patriotism and bombastic xenophobia would make him explode. I’m hoping the exercise stimulates some critical thinking that seems largely absent these days. Thanks. You do know this whole kneeling thing started under President Precious and not Trump, correct? Honestly, I regret the name-calling. I stooped to the example set by the current White House occupant, and it’s undignified. That said, I don’t see how the timing of when the kneeling started is germane. Well stated Art, denying anyone the opportunity to work based on silent protest is the height of un-Americanism and especially when that protest centers around what shouldn’t be an issue but is and that issue is, black lives matter just as much as white lives matter and the lives of both should be equally respected. Kaep thinks cops are pigs and that’s just fine with you. Equal respect and all that. Making logical, cogent statements isn’t a strong suit of yours now is it, Stoned? Getting mowed down by the local constabulary is not (typically) something we White folk need worry about — depending on our (current) Status. Maybe – just maybe – NFL employees could spend their non-work time pushing their political opinions. You know, like the rest of us.